Tomatoes are yummy by themselves, but add fresh roasted corn, basil, and cheese and you have a unique combination of flavors. This summer recipe is not only tasty and quick, only taking about 15 minutes. 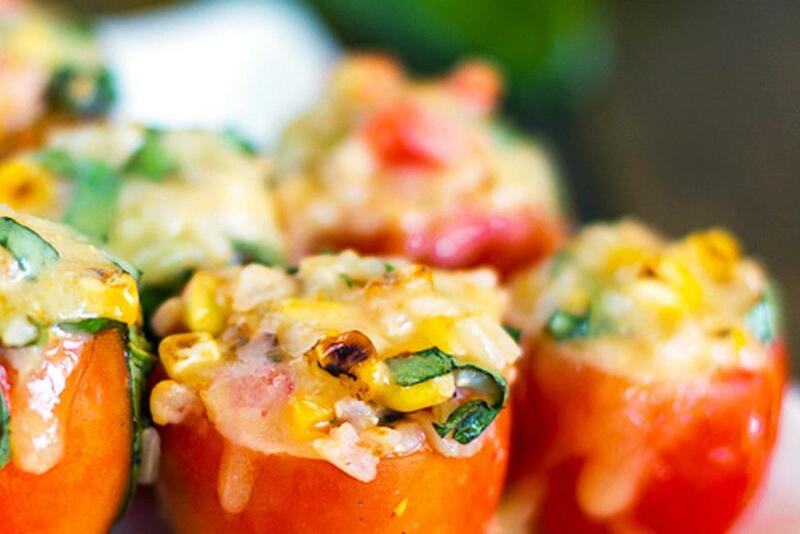 Enjoy these stuffed tomatoes for supper tonight! 1. Wash and dry the corn. Place corn in a sturdy non-stick or cast iron skillet over medium high heat with no oil or butter. Let sit for 3-4 minutes and stir. Repeat until corn gets nice and brown on the outside. Remove from heat and set aside. 2. Cut the tops of the tomatoes off and carefully scoop out the flesh, reserving the flesh in a separate bowl. Set whole tomatoes aside. Crush the tomato flesh with the back of a spoon or in a food processor until there are no large chunks. Don’t totally puree it – just chop/mash it up. 3. Combine the mashed tomato mixture, brown rice, basil, corn and garlic. Season with salt and pepper. Add a small handful of the shredded cheese, reserving some for topping. Stir it all together until well-mixed. 4. Preheat broiler. Stuff the whole tomatoes with the tomato, rice, and corn mixture until rounded on the top. Top with shredded cheese. Broil for 3-5 minutes or until cheese reaches desired meltness and tomatoes are heated through. Notes: Use a muffin tin to hold tomatoes upright while fixing them and while they are in the oven.